Tales Of A Nomad: Varkala- The land of cliffs, beaches & bikinis..
Varkala has always been there in my list for a long time and the two day break was apt for me to head to the small fishing hamlet. Being in the southern part of kerala, traveling from bangalore was indeed a long journey. 14 hours was quite a bit of time but the excite ment grew as I got down at Kallambalam. It is a deviation of around 10 kms from this point off the NH 47 to Varkala. This is approximately 45 kms before you touch Kerala's capital, Thiruvananthapuram. The auto rickshaws will drop you near the helipad from where you can see the clear blue sea. The south cliff is towards the left where you have a couple of resorts. However all action happens on the north cliff which istowards the right of helipad. I would recommend that any tourist who visits here should head for the north cliff rather than the south cliff in order to be in the middle of the action. To be frank I have not seen so many foreign tourists at one single place as I saw in Varkala. You hardly find any Indians other than the locals who run the shops and the restaurants. Being february I could feel the heat slowly catching up. 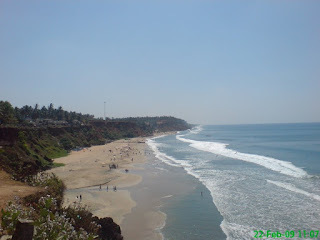 The best time to in fact visit Varkala would be September to January. The cliff is a long stretch of about a kilometer and half with the sea on one side and the shops & restaurants on the other. The shopkeepers lure you with all sots of articrafts which you can carry back home. Everything from woodworks, bangles, chains to apparels can be purchased from here. Though they price it high, make sure to bargain before you take your wallet out. I ended up entering almost all the shops before settling down on a small rudraksh for my wrist. Do not expect the markets to shut down with the sunset as the night life is simply amazing and it goes on till midnight (Bengaluru needs to learn a thing or two from Varkala). All the shops remain open and the restaurants display their fresh catch for the day to lure the tourists in the evenings. Drinking beer and having the sea breeze hitting my face in the darkness of the night with a tinch of music in the background gave me a high which no cocktail has ever given till date. The restaurants are quite expensive but never restrict yourself from exploring the delicious sea food. They do have live bands and they keep playing and dancing till midnight. Rarely do you find a cliff next to a beach, but, Varkala is where you can say, YES...its right here. From the top of the cliff steps take you down to the clear blue waters. Must appreciate the authorities for the way they have maintained the beach. It is the most well kept beach that I have ever been to. The waters are not very deep for about 100 meters. However the tides are quite strong. The tourists frolic the beach from the morning. I found people doing yoga, practicing karate, taking a sun bath, jogging etc. I actually found many just playing with the tides the whole day. With safe guards always roaming around tourists found it all the more safe. With so many bikini clad firangis around me I had doubts whether I was in Varkala or in Miami.. :) . The sunset view from the top of the cliff is one of the best you can ever see. This is one place you should go to if you want to just laze around. The feel of going back home would never be there. I just did not feel like leaving the clear blue waters, the fine sand and the beautiful babes. Must say this is the best beach I have been to and for the sheer beauty of the place I will go back again for a longer vacation. Signing Note: A beach lover's paradise (a bikini lover's too)..
thank u nanda..its an amazing beach. thanks ashwini. its a must visit destination. tc. thanks for dropping in. thanks mridu... everyone must add it in their list. That brought back memories of my college days! Been there 2-3 times and must say of all the beaches that i have been to, this one really stands out as the most beautiful and relaxing one! I absolutely second that. One of the best beaches I have been to. Yeah, should have. Had only a couple of photographs. Thank you. Had very few photographs.